You may know him as the witty and knowledgeable food judge from TV’s Masterchef. You may know him as one of Australia’s finest food writers. Or you may just know him as the hard-core foodie with a cravat collection to rival a seventeenth-century French monarch! Whichever way you look at him, he is Matt Preston and he is an institution in the Australian food world. And now, after shooting to renown through his Masterchef exploits he is here to share with you some of his finest food writing. 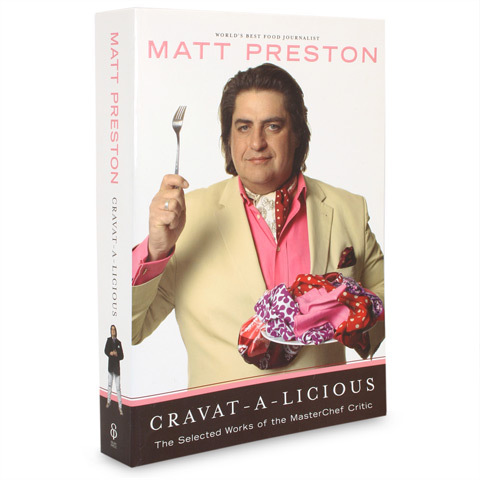 Cravat-a-licious offers foodies, Masterchef fans and avid readers alike a collection of Preston’s finest food writing from a truly illustrious career. Whether it’s his witty observations on what not to do in the kitchen, or his profound thoughts on Refugee Catering that won him the World Food Media Award for World’s Best Food Journalist, Preston’s writing is entertaining, engaging and utterly unique. So tuck in and enjoy some of the tastiest morsels that Australian food writing has to offer with Cravat-a-licious. You won’t be disappointed! Features articles published by Preston in Epicure (The Age), delicious, Vogue Entertaining + Travel and more. Includes articles that have garnered awards including Best New Australian Food Writer, Best Recipe Feature, and the coveted Le Cordon Bleu World Food Media Award for World’s Best Food Journalist. Packed with entertaining, insightful articles and Preston’s recipe ideas. Dimensions: 15.5 x 23.5 x 3cm.